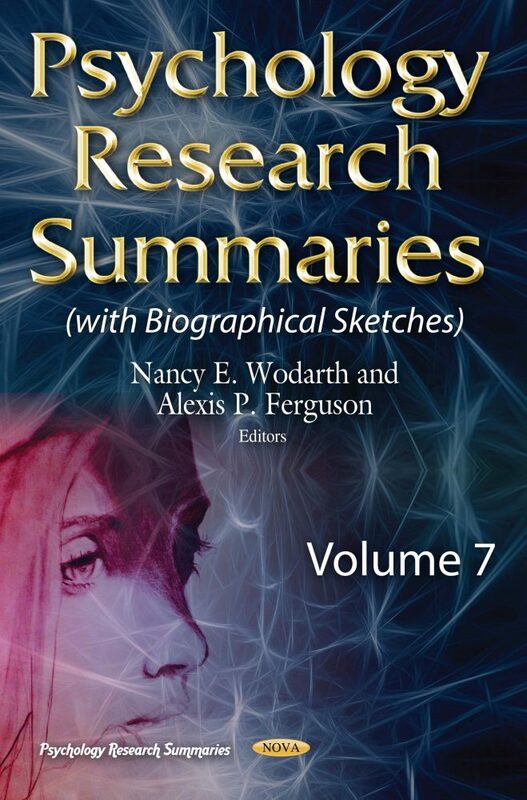 This book is a compilation of research summaries from a number of different focuses in the field of psychology research. Chapter 40	Effective Coach Learning and Processes of Coaches’ Knowledge Development: What Works? Chapter 82	Narcissism or Justice: Is It in the Eye of the Beholder? Chapter 91	Are Out-Group Stereotypes Influenced by Exposure to Religious Content? Chapter 120	An Economic Empowerment Initiative Partnered with Prevention Mother to Child Transmission (PMTCT) Programs for HIV-Positive Women in West Nile Uganda: Does Participation Increase Self-Efficacy Related to HIV-AIDS Stigma? Chapter 125	Hope, Engagement and Achievement at School: How Enhancing Hope can Increase School Commitment and Success? Chapter 145	Outdoor Music Therapy with Children and Adolescents: Sounds from the Wood? Chapter 171	Psychological Health among Frail Older Adults with Chronic Pain in the Community: Does the Healthy Living Program Help? Chapter 199	Risk Perception: Why Different Theories?